At 54, Petty shows no signs of slowing down. He and the Heartbreakers just completed a successful North American tour, drawing more than 550,000 fans to the 36 shows reported to Billboard Boxscore. 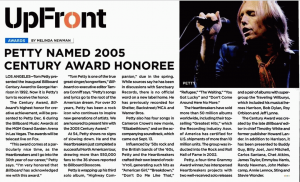 Petty also has four songs in Cameron Crowe's new movie, "Elizabethtown," and on the accompanying soundtrack, which came out Sept. 13. 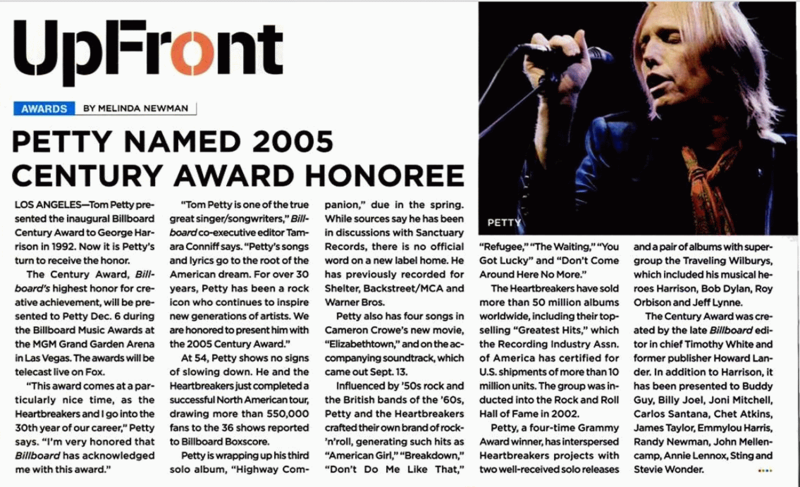 Influenced by '50s rock and the British bands of the '60s, Petty and the Heartbreakers crafted their own brand of rock 'n' roll, generating such hits as "American Girl," "Breakdown," "Don't Do Me Like That," "Refugee," "The Waiting," "You Got Lucky," and "Don't Come Around Here No More." The Heartbreakers have sold more than 50 million albums worldwide, including their top-selling "Greatest Hits," which the Recording Industry Assn. of America has certified for U.S. shipments of more than 10 million units. The group was inducted into the Rock and Roll Hall of Fame in 2002. The Century Award was created by the late Billboard editor Timothy White and former publisher Howard Lander. In addition to Harrison, it has been presented to Buddy Guy, Billy Joel, Joni Mitchell, Carlos Santana, Chet Atkins, James Taylor, Emmylou Harris, Randy Newman, John Mellencamp, Annie Lennox, Sting, and Stevie Wonder.